It's comfortable here. You'll likely live within a five-minute walk of your classes and friends, dining halls and libraries, the coffee bar and athletic fields. Find your home in a great big world. You'll spend your first two years in traditional residence halls, supported by live-in resident assistants who are there to show you the ropes and help you have a good time. 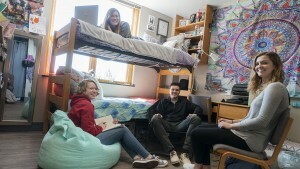 As an upperclassman, you'll choose among suite- or apartment-style options or opt to live in a house focused on a special interest—such as academic, diversity, or social justice. And you'll never have to worry about finding a place to live, because housing is guaranteed for all four years. If you are requesting special housing conditions such as air-conditioning, medical documentation from a physician stating the specific housing need is necessary; Form A or Form B must be completed for special housing needs. Return the form to the Office of Residential Life by May 31, in order for us to meet your request. For allergies and asthma with a documented medical need requiring special housing, complete form A; for all other special housing medical conditions, complete Form B. Forms should only be submitted if there is a documented medical need and special housing is absolutely required. 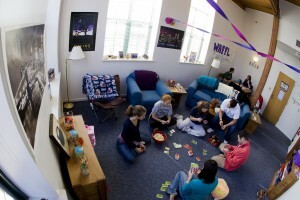 Lebanon Valley College is a four-year residential college and believes that an LVC education is the result of distinctively curricular and co-curricular experiences in class, on campus, and in the residences. As such, all first-year students, sophomores, juniors, and seniors are required to live on campus, unless they are enrolled as a commuting student. All resident students must have a residential meal plan. To be considered a commuter, a student must live within 30 driving miles of campus and commute from their parent(s)/guardian’s home or permanent residence daily. The change of housing status form can be obtained from the Office of Residential Life. The form requires a parent or legal guardian’s signature and must be received in the Office of Residential Life by May 1 for the fall semester and by December 1 for the spring semester. Students listed as a commuter and later found living in off-campus quarters will be assigned a room and meal plan on campus and charged accordingly. Most first-year students will be assigned to reserved first-year student residence halls. 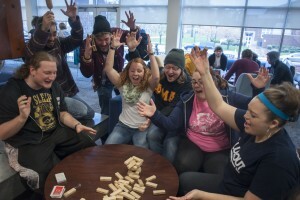 These first-year student communities have been developed to help new students adjust to their new academic environment and encourage their participation in activities, as well as develop bonds of friendship. The resident assistants are available to help promote a rewarding and enjoyable residence hall experience. Participation and mutual respect are the keys to a great residential experience.